The figure used for this unit is a Star Wars figure from the Bounty Hunters set. Its model number and name are #48/Tusken Raider Sniper. Character Bio - The Tusken Snipers are skilled in combat with the Gaffi Stick as well as the Cycler Rifle. The Cycler Rifle was an older design of rifle and fit into the Slugthrower class, firing solid shots enveloped in energy, not blaster bolts. The rate of fire was fairly slow, as many of the rifles used a bolt action mechanism. As such, Tusken Cyclers were not used at short ranges where a fast rate of fire was necessary. Rather, it was used in the sniping role to pick off enemies at long range, and was an effective weapon for its purpose. The Raiders retained the gaffi stick for dealing with enemies in close combat. 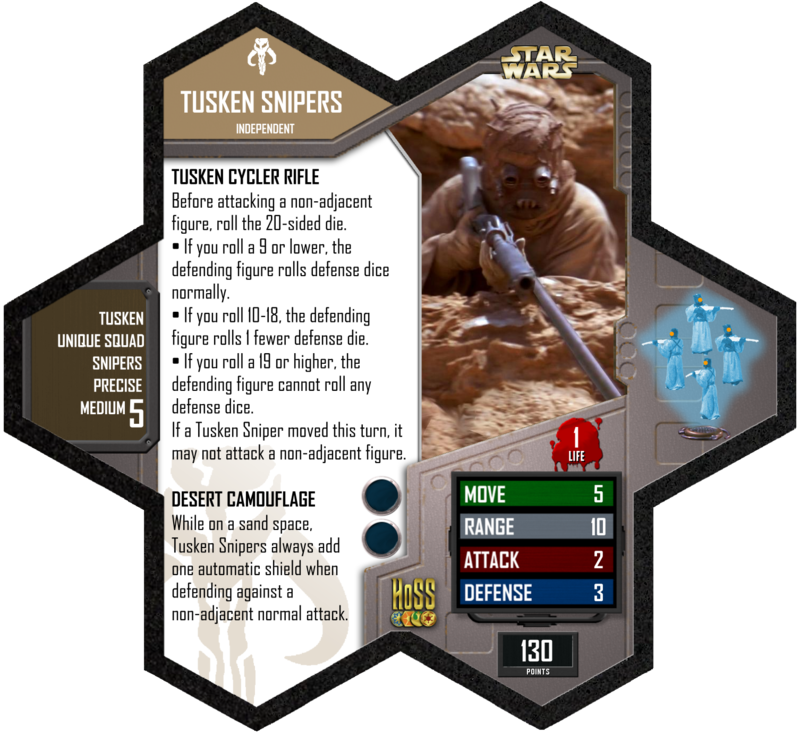 Being Tuskens, the Tusken Snipers may benefit from A-Zulmun's CLAN LEADERSHIP, TUSKEN BATTLE CRY, and TUSKEN RESOLVE special powers. Being figures who follow the Independent faction, the Tusken Snipers may benefit from Jabba the Hutt's UNDERWORLD CONNECTIONS turn bonding special power. Before attacking a non-adjacent figure, roll the 20-sided die. -If you roll a 9 or lower, the defending figure rolls defense dice normally. -If you roll 10-18, the defending figure rolls 1 fewer defense die. -If you roll a 19 or higher, the defending figure cannot roll any defense dice. If a Tusken Sniper moved this turn, it may not attack a non-adjacent figure. While on a sand space, Tusken Snipers always add one automatic shield when defending against a non-adjacent normal attack. 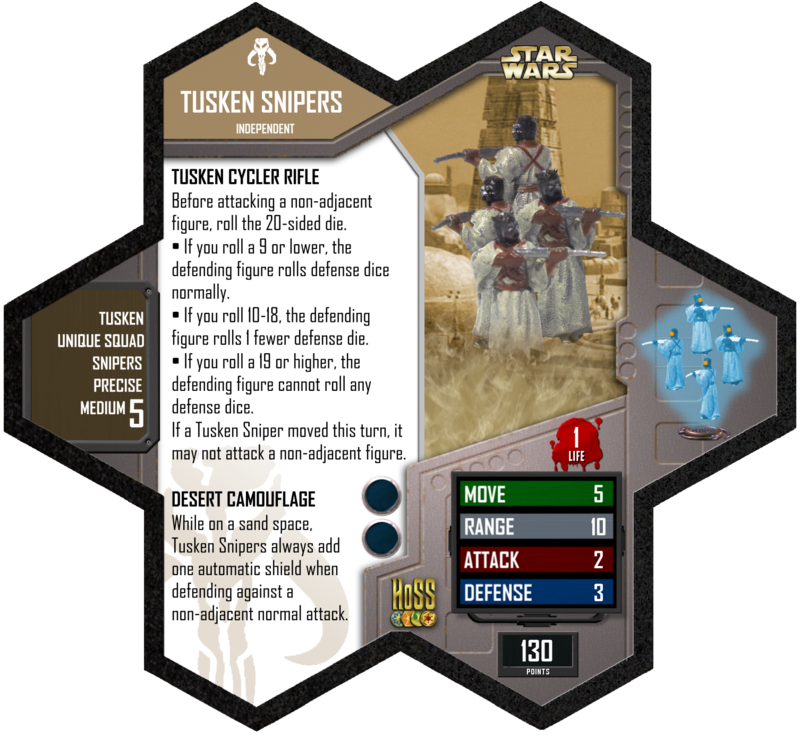 Being Tuskens, the Tusken Snipers may benefit from A-Zulmun's TUSKEN BATTLE CRY bonus. Being Tuskens, the Tusken Snipers may benefit from A-Zulmun's TUSKEN RESOLVE defense bonus. I haven't had a chance to use these guys yet but they look like fun. I love the idea of giving a ranged option to the Tusken faction (besides A-Zulman of course). I ended up with 11 extra Tusken Raider Sniper figures from an Ebay lot I bought. If anyone wants some or all of them at $1.75 each just let me know, otherwise in a couple weeks I'm going to sell them to an online site. (where they cost $2.49, just saying.) I'll throw in the HoSS card too. My trade thread, now with Classic, C3V and SoV units! All units come with cards. Trick is to make the enemy army come to you as you blast them with A Zulmun and the snipers, then when they get up to you swarm them with raiders. This is a great army, I had the honor of fighting against it. That was my intial thought as well when I saw the Snipers were 130 pts.